This chapter begins the in depth discussion of each of the VOWELS – the seven habitual characteristics that start with A,E,I,O and U. I would have made Attitude the first VOWEL even if it didn’t start with A because it is the engine that drives the entire train of great habits. “I believe that Each Day is a Gift and that you get a box to open each morning. Inside it may be the best day of your life (you truly inspire your team to succeed or close a big deal). Inside it may be the worst day of your life (I have a mother in her eighties with health problems. I probably have a bad day box on my way at some time in the future). Or it might be just a normal, mundane Tuesday in the box. In chapter 4 I continue the VOWELS examination with the first “E” – Energy. Energy is the fundamental source of everything in the universe and to reach your peak you must fully grasp and understand how harness its power in your life. When you get tired, you make bad decisions and cut corners. The goal with Energy is be the same person at 9am Monday morning as you are at 5pm on Friday afternoon – that’s almost impossible unless you learn to grow and maintain your energy reserves. “If you want to do something fun, Google the phrase “Energy Coach.” You’ll get hundreds of responses from folks who claim to be “The Energy Coach,” “the original Energy Coach,” “YOUR Energy Coach,” and many more! These “experts” have stepped in to fill the psychological void of how to manage your energy reserves. They give you practical tips on how to stay focused during a long day, how to break out of the rut of routines, and even how to work exercise into your workday and keep your mind sharp. In the next blog, we’ll take a look at Chapters 5 and 6. To order the book or the E-book now, go to my website at www.BradRaney.com and look for the link on the Homepage or go to the Products page. If you have any questions, don’t hesitate to reach out to me at Brad@BradRaney.com. 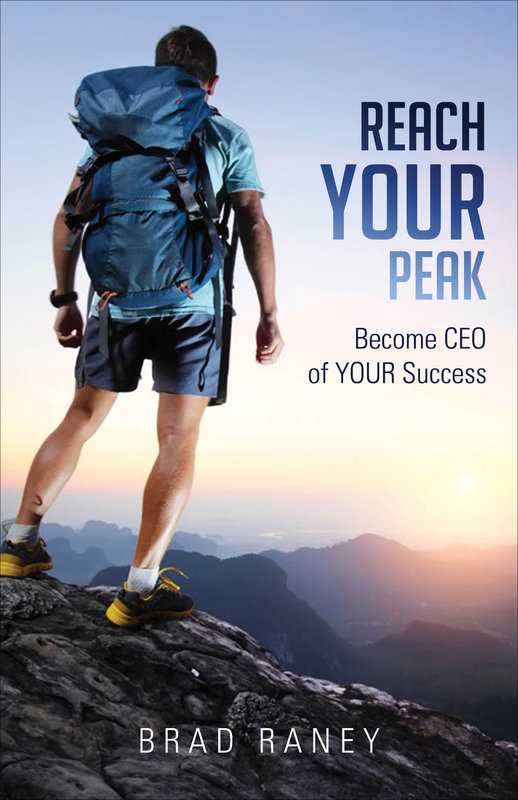 This chapter covers the entire premise of the book – empowering the reader to take control of their personal lives and professional accomplishments by acting and making decisions like a CEO. For that to happen, one must have the traits of a CEO. Chances are, if you pick up RYP, you have the skills, abilities and talents of a CEO – even if you don’t know it yet! “Take the time to reflect upon the attributes that you possess that are common to great CEOs. Ask folks who know you well to give you a list of attributes they believe you possess and compare your list to theirs. More than likely, you will find some cross over between what attributes you think you own and what your friends and colleagues see as your strengths. In the second chapter I introduce the VOWELS concept that I created in 2009 to get my sales team through the worst economic year since 1930. The VOWELS are seven habitual characteristics that start with A,E,I,O and U and they are: Attitude, Energy, Effort, Integrity, Intensity, Outlook and Uniqueness. Once you learn to harness the power in each of these tools, you can build the future you really desire. “Learning to master these traits is critical to anyone who wants to set and achieve high goals – to go beyond what they think is really possible, to actually reach their personal peaks in every aspect of their lives! In the next blog, we’ll take a look at Chapters 3 and 4. To order the book or the E-book now, go to my website at www.BradRaney.com and look for the link on the Homepage or go to the Products page. If you have any questions, don’t hesitate to reach out to me at Brad@BradRaney.com.